Explore the Park With Your Own Pontoon Boat! From the park entrance, take your first right. Follow that road to the Pier Store. There you will park, buy tickets and snorkel gear. Then jump on a Shuttle Bus provided around to the other side of the park where you will board the Shell Island Shuttle! When you return to the mainland from Shell Island we will pick you up and return you to the Pier Store parking lot. From the entrance, continue straight on State Park Lane. You will reach a four way stop and see the Camp Store ahead. 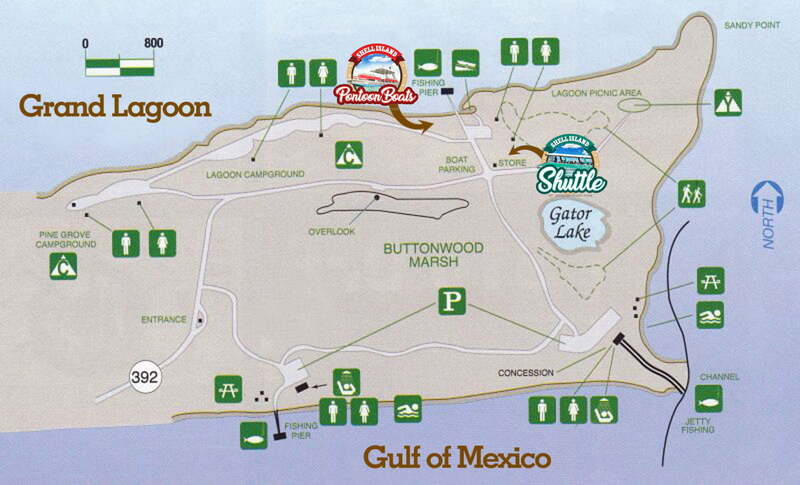 Parking is on your left and the Pontoon Rental Booth is down by the Dock and Boat ramp. If you need any further assistance, please feel free to contact us! Shell Island is a piece of what this slice of Florida’s Panhandle used to be. Before man brought the condos, merchants and restaurants here, the residents flew, and swam and crawled along these untouched shores. Would you share this experience with us if only for a day, the warm sand and temperate waters with the creatures of Shell Island and St. Andrew’s State Park. Don’t forget to bring a picnic lunch, a towel and a camera. And if for no other reason than to capture one precious moment in time, while you can. I pray that you can experience what true natives of this land continue to enjoy as their home.